In their first moments of meeting each other, U.S. President Donald Trump and North Korean leader Kim Jong Un both sought to project a sense of command but displayed some anxiety at the start of their high-stakes summit in Singapore. 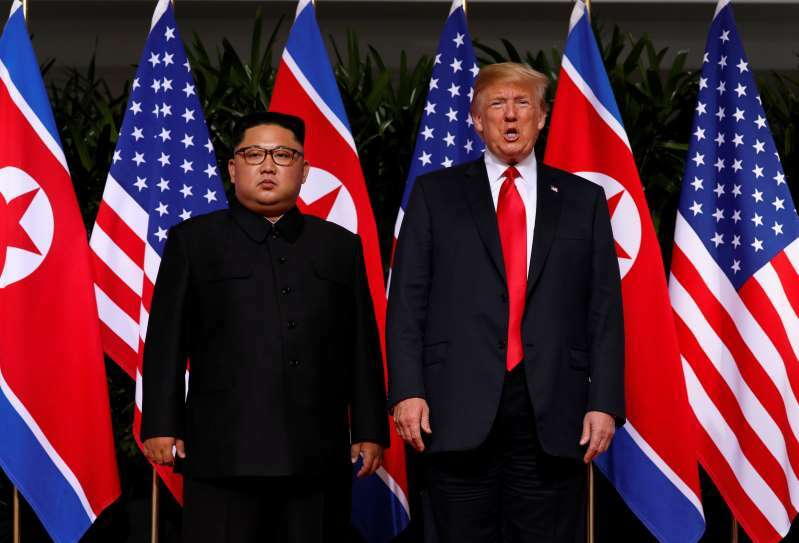 Body language experts said that in the 13 seconds or so the U.S. president held on to the hand of Kim for the first time, he projected his usual dominance by reaching out first, and patting the North Korean leader's shoulder. Not to be outdone, Kim firmly pumped Trump's hand, looking him straight in the eye for the duration, before breaking off to face the media. "It wasn't a straight-out handshake," said Allan Pease, an Australian body language expert and author of several books on the topic, including "The Definitive Guide to Body Language." "It was up and down, there was an argy-bargy, each one was pulling the other closer. Each guy wasn't letting the other get a dominant grip," he told Reuters by telephone from Melbourne. Trump and Kim are meeting in Singapore for historic talks aimed at finding a way to end a nuclear standoff on the Korean peninsula. Should they succeed, it could bring lasting change to the security landscape of Northeast Asia, like the visit of former U.S. President Richard Nixon to China in 1972 led to the transformation of China. Ahead of the meeting, Trump had said he would be able to work out within the first minute whether his North Korean counterpart was serious about making peace. Projecting authority comes easily to Trump, who as a global leader, businessman and former television personality is well-versed in using body language effectively. He also has a height advantage over Kim. While both men walked to the library where they held their first face-to-face meeting, Trump sought to ease any tension in the air by chatting to Kim, and letting him walk slightly ahead. Trump, however, maintained control over the chat by patting Kim, and using his hand to guide him, who is almost half his age, into the room. Kim also patted Trump, in an attempt to assert control. He mainly looked down, listening, as Trump spoke, but did look up at several times during the conversation. "Donald Trump was talking in conciliatory terms, almost submissive, but his body language was clearly saying 'I am in charge here'," Pease said. "If you didn't know who these people were, you'd say the big guy was the father and the little guy is the son." Karen Leong, Managing Director of Singapore-headquartered Influence Solutions, said Trump did not display any of the hostility seen at the G7 summit in Canada last week, during which the U.S. leader blasted allies including the European Union and Canadian Prime Minister Justin Trudeau over trade. A photograph showing Trump sitting with his arms folded as German Chancellor Angela Merkel speaks was seen as defining the acrimonious nature of those talks. Still, Trump's desire for dominance was on display. "Whenever they're shaking hands, you can see the whites of their fingertips - these two guys are alpha males," Leong said. "They both want to show dominance and that is why there's this bone-crushing handshake." "Trump is a gambler and he's gambling on being able to rein in North Korea like a parent does to naughty child," Leong said. This contrasted with Kim, who had comparatively less to lose, having already scored a major win through Trump's agreement to meet him. Kim's first major interaction with the international community also betrayed a sense of awe and wonder as he faced the rapid fire shutters of photographers in the opulence of the Singapore luxury hotel where the meeting took place.